Video clip synopsis – Vika and Linda Bull talk about the importance of their heritage and connection to Tonga. Broadband MP4 songfor_bb.mp4 (9.9MB), suitable for iPods and computer downloads. This interview with Vika and Linda Bull was recorded for the Pacific Stories website produced in 2005. Vika and Linda Bull are Melbourne-based singing siblings and are two of Australia’s most popular performers. Their mother is Tongan and father Australian. 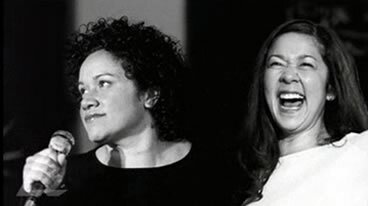 Linda and Vika explore the rich diversity of their Tongan cultural heritage through their songs and creative life. Learn about the histories of the various people who live in Australia today, the diverse heritages, experiences, perspectives and aspirations. In the Civic and Citizenship domain at Level 6, Australia’s place in the Asia Pacific region and the world are examined. The independent Kingdom of Tonga is the only monarchy among the Pacific nations. King Taufa’ahau Tupou 1V, inherited the throne from his mother Queen Salote Tupou 111 in 1965. King Taufa’ahau Tupou was much revered by his subjects and under his rule people enjoyed stability and prosperity. Despite his popularity, there was, during the latter part of his reign, some questioning of this system of government, where power and privilege are inherited. A pro-democracy movement argued that as Tonga modernised and changed, so too should the form of government include more participation in decision-making by all of its citizens. Modernisation and change in Tonga has also included Tongans migrating in large numbers seeking work and better wages. The number of Tongans living outside Tonga (particularly in Australia and New Zealand) is now larger than the population at home – 110,000 Tongans are spread across three dozen inhabited islands and even more live abroad, mainly in the US, New Zealand and Australia. The main source of national revenue in Tonga today is in the remittances sent home by Tongans residing overseas. To what extent this continues in the future will depend on the younger generation many of whom now have stronger cultural influences from their adopted countries. These people with Tongan heritage may not be treated as ‘true Tongans’ when they visit Tonga — due to language inadequacies or cultural differences. This video clip features popular singers Linda and Vika Bull. Their mother was one of the first Tongans to travel to Australia. Initially she moved to study nursing with the aim of returning to Tonga; however she married and remained in Australia. Linda and Vika, tell how in 1994 they were invited to perform for King Taufa’ahau Tupou 1V’s 75th birthday celebrations. They speak about identity, language and music and the importance to them of their heritage and connection to Tonga. Why do you think it was so important for Linda and Vika’s parents to take their children back to Tonga for a visit? Do you think a wish to return for a visit to their original homeland is a common experience of many immigrants to Australia? What issues did Linda and Vika face when they returned to Tonga? Why do you think they were issues for them? How did they try to overcome them? Linda and Vika Bull use music to record some aspects of their culture. How can music contribute to the oral traditions of History? Are there other ways of recording historical events? Give some examples. Discuss in class which ways of recording past events appear to be better than others. Try to get a copy of a Linda and Vika Bull CD. Analyse the words in their songs. In what ways do they use their music to reflect on their Tongan origins?